When my husband graduated from seminary, I wanted to get him a great gift to commemorate it. He’d just completed a 99 hour master’s degree while working two jobs, being married, and parenting two kids. Because I am terrible at picking gifts, I asked him to just tell me exactly what it was that he wanted. He said he wanted a Bible. I thought it was kind of a lame gift. (A pastor graduates seminary and gets a new Bible – it was a little too on the nose for my taste.) But he said RL Allan doesn’t just make Bibles, they make the best Bibles. Plus he already had a lot of Bibles. I think he might still have every single Bible he was ever given from the tiny blue New Testament he got at his baby dedication to his teen study Bible filled with angsty notes scribbled at youth camp. But this Bible was different he assured me. This would be the last Bible he would ever own. Also, it was the most expensive Bible I’d ever seen. This post, Nine Best Bibles for Every Stage of Life, contains affiliate links which means that if you click on a link and make a purchase, I’ll receive a small compensation at no extra cost to you. You can read our full disclosure policy here. It was handmade by a family in Scotland that has been making Bibles for 150 years. The paper is opaque with very little bleed through. The binding is strong yet loose so it lays flat no matter what page you turn to. It was written in his favorite translation (ESV), and the highland goatskin leather cover is supple beyond description. It is the sort of Bible that is destined to be a family heirloom. Since then, he’s preached every sermon from it and will probably never ask for another Bible unless a tragedy befalls this one. And then I’ll just get him the same one. Most of us don’t have the luxury of spending countless hours with men who hold doctoral degrees in all aspects of religion and getting to talk to them about Bibles. We haven’t studied the Bible in Greek and Hebrew so that we can say which translation is the best and have a well of knowledge on the matter. For most of us, choosing a new Bible is kind of a hassle. There are so many choices that it is truly overwhelming. To help you with this decision, we’ve compiled a list of our favorites. Here are our recommendations for the best Bibles for every stage of life. Our kids love this toddler Bible. It is a story book Bible, and it’s perfect for our whole family. Our nine and six year old like reading it to our three year old, and our three year old loves to just flip through and look at the pictures. She often “reads” to her dolls, and it makes me so happy to hear her retelling the stories of the Bible. The illustrations are cartoonish instead of the serious illustrations from my children’s Bible growing up. The text is easy to read and comprehend without changing any of the core message. We read this Bible at night before bed and my older kids love the idea of reading through the entire Bible. The cover says that it only takes seven minutes a day which is about right for how long it takes us to read the designated daily text. What they fail to mention is the additional 70 minutes of questions the text generates. This is a great Bible for kids. I love devotionals and supplemental texts as much as the next Christian, but nothing compares to God’s word. I wish that my family had encouraged me to read the Bible more growing up so that I wouldn’t feel so intimidated trying to read it as an adult. This Bible is written at a third grade reading level and is the full Bible – not a summary. This Bible is the next step up from the Adventure Bible for Early Readers. It also comes in blue and pink imitation leather if your child doesn’t like an illustrated hardcover. There are tons of great Bible choices specifically geared towards teens – teen boys, teen girls, new Christians, teen study Bibles, pocket Bibles, Bibles/devotionals, etc. And most parents will be able to choose one that is a good match for their teenager. For a more generic teen Bible, this one is great choice because it is written in an easy to read translation, it’s small, and it’s gender neutral. This is another great choice. And if you’re looking for something more tailored for your teen, check these out. Basically, like most things for teens, there isn’t a great “one size fits all” choice. The New Living Translation is easy to read. Being able to easily understand the text is especially important for someone just starting their Christian journey. This particular Bible has the Life Application Life Topics Index and the One Year Reading Plan included in the back. I don’t know if Bible journaling is just a fad or if it’s here to stay, but I love it. My husband bought me this exact Bible for Christmas last year (I know – pastor gets wife a Bible for Christmas, how cliche). It actually took me a little while to feel comfortable coloring in my Bible, but now I’m totally hooked. I haven’t painted or used washi tape yet, but I love being able to doodle while listening to the sermon on Sunday. It’s perfect for the distracted learner. If you’re interested in Bible journaling, you should check out this post How to Bible Journal When You Aren’t Talented or Creative. Having a Bible that I’m drawing in has also been a great way to help my kids sit still in church. Sometimes they draw in my Bible with me and I know that I’ll treasure those drawings and notes when they get older. Sometimes they draw in their own Bibles. It’s really neat to see them interacting with the text on their own. They underline key passages and then illustrate them in the margins. My husband also ordered me a some great writing utensils and a wet bag to put it all in. Keeping it all together makes it easy to throw into my purse on Sunday mornings and keeps my kids from messing with it at home. This study Bible is great. It has introductions and annotations to every book of the Bible. It also has charts, maps,Biblical harmonies, personal notes, chronologies of Old Testament kings and prophets, and appendices. There are more than 20,000 entries, over half of which were written by John MacArthur. The Bible is available is five different versions, six different languages, and has won numerous awards. My husband and I were immediately drawn to this Bible, we thought it was so cool. It puts the entire Bible in chronological order instead of the traditional order. When I first started reading it, it felt strange because it’s not in the order that I’ve seen for my entire life. But, it really helped me to see the timeline and how the stories in the Bible relate to one another. For example, one chapter will tell a story from the life of King David from 2 Samuel, then you’ll get the same story in 1 Chronicles. And then, the next chapter might be a Psalm written by David in that same time period. There you have it. 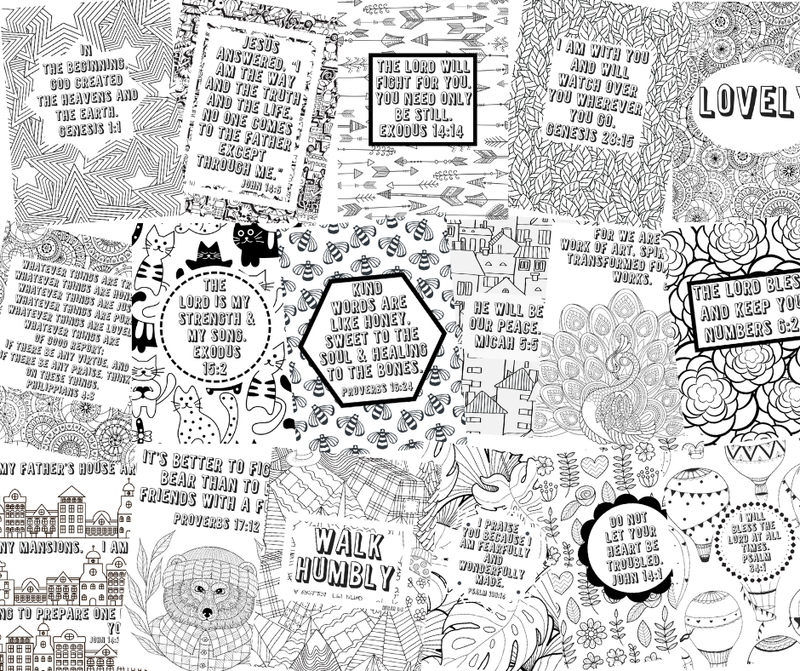 Nine of the best Bibles for different phases of life. My husband would add to this list any Bible made by RL Allan and Son. He loves his Bible a lot. Like he talks about his preference for a single column of text and each verse starting on a new line like they are matters of grave importance. And while those things are important to him what is most important to me is that he reads his Bible. I hope you have a Bible that is a joy to read. If you don’t, check out our links. Did your favorite Bible make our list? Thanks Ashley! All of my kids love the picture Bibles – even the nine year old! Ashley, what a great resource! We have pretty much outgrown our baby bible and I would love to check out the toddler bible soon! We never look at the baby bible and just stick to our nightly prayers. Thank you! The toddler Bible is awesome! It is a board book so you don’t have to worry about them tearing it up and the illustrations are great! Great resource to check in as we continue to grow in ourselves and our faith! I’m in love with the Jesus Storybook Bible – the one that comes with the audio CDs, too! Every story points to Jesus. ❤️ My preschoolers love it and I look forward to them being able to read it themselves. There’s audio CDs?!? My kids would love that!!! Thank you so much for telling me about that! Heading to Amazon now. ? We have the NIrV bible already. I look forward to checking out some of the others as my kids grow. My kids love getting new Bibles as they grow older!